If you love NASCAR, and you’re looking to catch all of the action without a sky-high cable bill, you may be wondering if you can watch NASCAR without cable. The answer? Yes! Thanks to today’s internet TV services, you can watch every NASCAR race live without a pricey cable subscription. In this article, we’ll go over your top 6 options for watching NASCAR without cable, so that you can make sure you don’t miss out on a second of this year’s top races, like the Daytona 500. NASCAR coverage is being provided by FOX and NBC, in a joint coverage agreement. Each company airs different races and events. The Monster Energy NASCAR Cup Series, for example, will primarily broadcast by FOX this season, but NBC will air the NASCAR Playoffs. If you can get all of these channels, you’ll be able to get coverage of every race and have everything you need to watch NASCAR without cable. Let’s dive into your options. fuboTV is a sports-focused streaming service, so it should come as no surprise that it’s a good option if you want to watch NASCAR without cable. It also has a good number of entertainment, lifestyle, and news channels. fuboTV offers two primary channel packages, alongside a few international options, as follows. The base-tier, $45/month fubo package provides a total of 80+ channels and will get you both FOX and NBC, as well as NBCSN and FS1, so you’ll have everything that you need to watch NASCAR without cable, and you won’t miss a single second of races this year. For $5/month more, you can get the fubo Premier package with 100+ channels; however, that’s not necessary if you’re only really interested in NASCAR. fuboTV has pretty good features for NASCAR fans, although the cloud DVR is a bit limited, at 30 hours. Given the lengths of NASCAR races, you may want to pay $10/month to upgrade to 500 hours of storage, if you regularly DVR multiple races and watch them later. You can also watch on 2 devices at once, which is fairly standard, and add a third stream for $6/month with the “Family Share” add-on. fuboTV also has good device support. You’ll be able to watch NASCAR without cable on almost any device you can imagine, from your iOS and Android devices to your web browser, Chromecast, Amazon Fire TV, Apple TV, and Roku. If you’re interested in giving fuboTV a try, you can head to its website for a free trial now, and see if you like the service. Sling TV is the oldest internet TV service around. It launched way back in 2015, with an “a la carte” approach to streaming that allowed customers to pick the channels they want. Today, it’s still a good option for cord-cutters looking to watch NASCAR without cable. Sling TV has three primary channel packages. Sling Orange, Sling Blue, and Sling Orange + Blue. Both Sling Orange and Sling Blue are $25/month, and while there is some channel overlap, each package has some exclusive channels. Sling Orange, for example, has ESPN and Disney-owned channels, while Sling Blue has FS1 and broadcast channels. As you may be able to guess, Sling Blue is the package you should go with. It includes NBC, FOX, FS1, and NBCSN. That means you can get all of the channels you need to watch NASCAR without cable for just $25/month, which is a really incredible deal. If you want, you can combine Sling Blue + Orange for $40/month with Sling Orange + Blue, but this isn’t really necessary if you just need to watch NASCAR. Sling TV has pretty good features, but you’ll have to pay extra for the DVR, which is a little disappointing. For $5/month, you’ll get a cloud DVR with 50 hours of storage, and no other restrictions. Still, even with this fee, you’re only paying $30/month to watch NASCAR without cable. Simultaneous streams are good, too. While Sling Orange lets you stream on only 1 device at a time, you can stream on up to 3 devices with Sling Blue, which is really nice if you have a larger family that watches a lot of TV. Device and platform support for Sling TV is also good. You can stream on your web browser, and on iOS and Android devices on the go. At home, you can stream Sling TV on Apple TV, Roku, Amazon Fire TV, and Chromecast, as well as the Xbox One console and some smart TVs from Samsung and LG. If you’re interested in giving Sling TV a try, you can sign up for a free trial today. 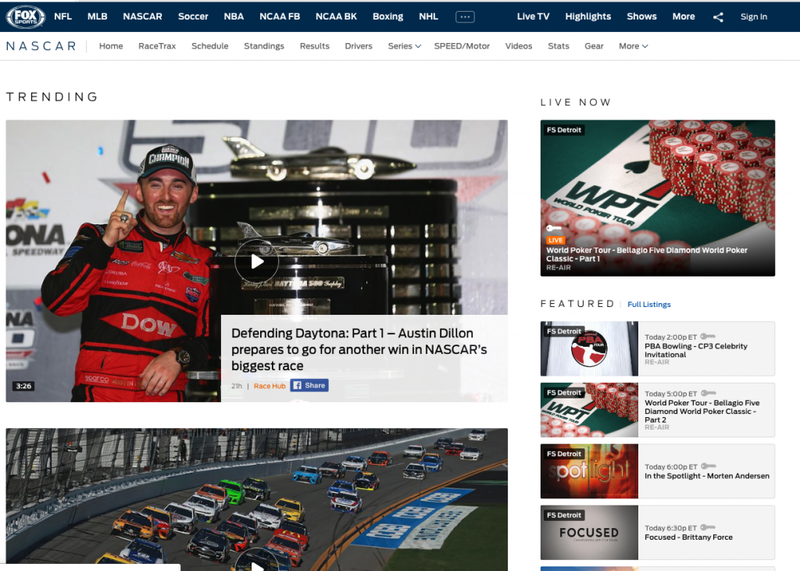 Hulu With Live TV underwent a price hike in February 2019 but is still a good way to watch NASCAR without cable, particularly if you don’t already have a Hulu on-demand subscription. Let’s get into the details now. Hulu With Live TV costs $40/month but will jump to $45/month by mid-February. For your money, you’ll get around 60-70 channels depending on your location, as well as an included Hulu on-demand (with ads) subscription. For $51/month, you can upgrade to remove ads from Hulu on-demand. You’ll still see ads when watching live TV, though. Your subscription will get you FOX and NBC, as well as NBCSN and FS1, so you’ll have every channel you’ll need to watch NASCAR without cable. Hulu has pretty good features, and they can be upgraded for a reasonable fee. Let’s start with the included cloud DVR, which provides you with 50 hours of storage. For $10/month, you can upgrade this to 200 hours of storage, if you need more space. Simultaneous streaming is similar, providing you with a fairly standard 2 simultaneous streams. You also get the option to add an Unlimited Screens package for $10/month, which will allow you to stream on as many devices as you want on your home WiFi network, and on 3 devices at once outside of your network. Platform support for Hulu With Live TV is also great. Naturally, you can watch Hulu through your web browser, and on iOS and Android devices. Additionally, Hulu With Live TV supports Apple TV, Roku, Chromecast, and Amazon Fire TV, as well as the Xbox One and Nintendo Switch gaming consoles, and some smart TVs from LG and Samsung. YouTube TV, from Google, first launched in 2017 and offers a great selection of channels and top-of-the-line features for a low price, making it a top choice for cord-cutters who want to watch NASCAR without cable. YouTube TV keeps things simple and offers only a single package of channels, which will cost you $40/month. For your money, you get around 60+ channels, including FOX and NBC, as well as FS1 and NBCSN, which means you’ll have all the channels you need to watch NASCAR without cable on YouTube TV. You’ll also get plenty of other sports, news, and entertainment channels. YouTube TV has a good channel selection, but it really excels when it comes to features. Let’s start with the cloud DVR, which offers users unlimited storage for 9 months. You can record as many NASCAR races and hours of content as you want, with no restrictions beyond the 9-month deletion period. You can also make up to 6 accounts, and each one gets their own DVR. In addition, you can stream on up to 3 devices at once with YouTube TV, which ties it with Sling TV when it comes to multiple-stream support. YouTube TV used to be a bit lacking when it came to platform support, but has added support for a number of new platforms over the last year or so. Today, you can watch YouTube TV on the Chrome browser, on iOS and Android, and on Roku, Chromecast, and Apple TV, as well as a number of different smart TVs from Samsung, Hisense, LG, and some other manufacturers, and the Xbox One. PlayStation Vue combines family-friendly features with a solid lineup of channels and, contrary to popular belief, you don’t need a PlayStation gaming console to subscribe. PlayStation Vue offers four different channel packages, as follows. To get FOX, NBC, FS1, and NBCSN, you’ll only need to subscribe to the cheapest, $45/month “Access” package. You can upgrade to a more expensive package for more channels. PlayStation Vue is an excellent choice for families who watch a lot of TVs because it allows you to watch your content on up to 5 devices at once at no extra charge. Its simultaneous streaming is better than any other service on this list. You can also create up to 10 accounts, and personalize each one. The DVR allows you to store as much content as you want for up to 28 days, which is a bit restrictive but provides you with plenty of time to catch up on the latest races, in most cases. As far as platform support goes, PlayStation Vue supports web browsers, iOS and Android, Amazon Fire TV, Roku, Apple TV, and Apple TV, as well as the PlayStation 3 and 4 consoles. DirecTV Now, owned by AT&T, is the company’s attempt to reclaim some of the profits lost by cord-cutters who are ditching satellite TV. It’s a pretty good service but lacks some of the polish and features of other options on our list when it comes to watching NASCAR without cable. Like PlayStation Vue, you can pick between four different packages with DirecTV Now. To get NBC, FOX, NBCSN and FS1, you’ll only need the “Live A Little” package, which is a good thing, because the next-most-expensive plan, Just Right, costs an extra $15/month. DirecTV Now has been lagging behind the competition when it comes to features. It didn’t have a cloud DVR until late last year, for example. Now that a cloud DVR is available, it’s the worst on the market, with only 20 hours of storage and a 30-day content expiration date. Simultaneous streams are a bit better. You can stream on 2 devices at once, and add a third stream for $6/month. Platform support is also fine, but nothing to write home about. You can watch DirecTV Now on your web browser, on iOS and Android, and on Amazon Fire TV, Chromecast, Roku, and Apple TV. Both FOX and NBC are broadcast networks, not cable networks. This means that each independent FOX and NBC affiliate station is independently owned, and they each negotiate deals with internet TV services like Sling and fuboTV individually. What this means is that even if you do live in an area with a local FOX or NBC affiliate station, it’s possible that one – or all – of the above streaming services will not have negotiated a deal with that station. This, in turn, means that you might not get FOX or NBC, even if these internet TV packages normally do carry local affiliate stations. Don’t worry, though. Each individual service offers a channel lookup tool, so you can check which stations you’ll receive in your area before you sign up. If you’ve found that none of the above streaming services carry NBC and FOX in your area, don’t despair! Sure, you may not be able to watch NBC and FOX using an internet TV service, but you can always invest in an OTA antenna, and watch NBC and FOX races using your antenna while using an internet TV package to watch NBCSN and FS1. For more information about using an antenna to watch OTA networks like FOX and NBC, check out these articles.